After having suffered losses on the first two days of the May 2004 tournament, Ozeki Takanonami decided to hang up his mawashi officially marking the end of an era that produced five of sumo's all time greats: Takanohana, Akebono, Wakanohana, Musashimaru and Takanonami. His 17 year career saw the former Ozeki and winner of 2 yusho secure a permanent place in the sumo record books with a record of 777 wins, 558 losses and just 13 absences. He is the 4th longest serving Ozeki in the history of the sport having held the rank for a total of 37 tournaments. To the great delight of the spectators he fought like a devil even after his fall from the top and returned several times to the sanyaku ranks where he made his final bow in taking the record for the Ozeki who continued the longest (362 bouts) after having lost his rank. Just like the original Hanada clan: Yokozuna Wakanohana I, and the Ozeki Takanohana I the young Sadahiro Namioka comes from the colder climes of northern Japan; from Aomori prefecture. At he age of 15, he joined Fujishima Beya, then run by Futagoyama oyakata, (former Ozeki Takanohana I and current vice-president of the NSK). On his debut at the Osaka tournament in March 1987, despite a long-limbed and gangly underwight appearance, he already weighed 120 kg, a weight he eventually increased to 160kg when at his peak around ten years later. During his Maezumo tournament, he outclasses his fellow beginners and as a result obtained the rank of Jonokuchi 4 East for his first official classification and he went on to achieve an excellent 6 wins to 1 defeat record. He did however, have a rather large problem to overcome in the shape of his Oyakata's anger! In fact at their debut tournament, most new recruits are left to themselves in order that they develop their own style of sumo; a simple choice at this stage of choosing between oshi-zumo (pushing) and yotsu-zumo (body to body sumo with a mawashi grip) to be refined later. With this retraining contrary to his natural style, the future Ozeki Takanonami starts a laborious climb up the banzuke, stringing together scores of 4-3 with occasional make-koshi. After a year, in March 1988, when the sons of his master, future yokozuna Takanohana and Wakanohana III, are making their debuts, Namioka is ranked only at the bottom of Sandanme, and he will need a further year to reach Makushita. His passage through this division lasts nearly two years, and proves very frustrating for him. The first reason for his bitterness arises from the spectacular progress of the young Takanohana and Wakanohana, who do him the affront of becoming sekitori before him. The elder man, who used to give them orders, henceforth becomes their subordinate, answerable to their merest whim, showering after them, preparing their food, etc. Namioka's pride is going to continue to receive a rough ride for almost a year, but an important event will at last let him curtail his stay in Makushita. At the November 1989 tournament, Namioka, who has just won 4 consecutive kachi-koshi (4-3) with difficulty, gets seriously injured and withdraws from the tournament. Accepting an idea which he has been chewing over for some time, his Oyakata realises that there is no point in suppressing Namioka's natural style and decides to give free rein to his prot�g� to allow him to gallop at last. The octopus has from now on the right to develop his technique with his toughened body, and he sets off to catch up with the wild progress of the Hanada brothers. The machine has some failures at first, but it makes good progress forwards. Finally, at the end of the Hatsu Basho in 1991, he leaps through the precious opening and the young sekitori will from now on be fighting under the shikona of Takanonami. On the way to the top, Takanonami spends only 4 tournaments in Juryo. He makes the acquaintance of a young Hawaiian whom he will face 58 times in Makuuchi (a record). This is Musashimaru, promoted to Makuuchi the same time as Takanonami at the tournament in Kyushu in November 1991. Both of them had spectacular debuts in Makuuchi, followed by varied luck on the borders of sanyaku. 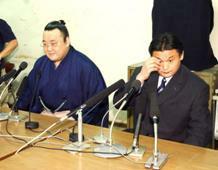 Nevertheless both were promoted to Ozeki at the same time at the end of the January 1994 tournament. Thanks to this promotion, the new Futagoyama has 3 Ozeki (Takanohana, Wakanohana III and Takanonami), as well as two former Sekiwake (Akinoshima and Takatoriki) who will later regain their rank. This expressive picture does not stop there: the powerful heya will number up to 11 sekitori at the same time, and will completely dominate the 90s, gathering 30 yusho. For Takanonami, the fact of belonging to such a powerful heya is a godsend, since it means that he has fewer top opponents to face. But it is also an inconvenience since they may have to be fought for the yusho. In fact, following any slightest error, it becomes impossible to catch the man in the lead to challenge or fight him. Against a Takanohana who is almost unbeatable during the period 1994 - 1996, Takanonami posted many performances of the highest order, like during 1994 when he produced 5 tournaments with 12 wins or more, that was not enough: he remained in the shade, his yusho tally blank. To win his first yusho in the end, he knew that he would have to face his brother in arms, the giant Takanohana, which in this period was no easy matter. After a year 1994 when he loses a three way play-off against Akebono and Takatoriki at the Haru Basho, Takanonami prepares to attain at last his first yusho when, unfortunately, the first injuries occur to his precious ankles. Takanonami's very unusual style in fact forces him very often to be driven back to the edge of the dohyo, to the brink of defeat, but with his grip on his opponent's arms, he spins round at the last moment to change the attacker into the attacked. Later, using his 1.96m, he pulls up opponents smaller than himself, almost off the ground, and forces them out. A unique style, but completely ineffective against a talented opponent who is taller than him. 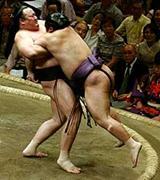 Akebono, 2.02m, made him understand this well in winning 24 of their 27 bouts. In short, the task seems severe. How to prevent Takanohana from lining up the yusho one after the other. But Takanonami throws himself into battle more motivated than ever. He suffers a reverse on the 5th day against a maegashira (Kenko), but this loss is his only one after the 13th day. On the other side, Takanohana is still unbeaten and is destroying his opponents with such ease that observers can hardly believe it. It is therefore a huge shock when Takanohana loses to his debut classmate Kaio on the 14th day. Takanonami, who has just defeated his rival Musashimaru, cannot believe his eyes. It is all to play for on senshuraku (the last day), with him facing Kaio and Takanohana against Musashimaru. To maintain the breathless suspense of this tournament, which is duty- bound to end in a grand finale, the stable mates of Futagoyama beya win their bouts, and the scene is set for a duel between the brilliant Yokozuna and his lieutenant; few watchers expect the Ozeki to win. The fateful bout commences, and Takanonami cleverly denies the younger wrestler the slightest grip on his mawashi. Afterwards, via a fine manoeuvre, the octopus wraps up Takanohana's left arm, the same time placing himself sideways against him, with his right side against the yokozuna's left side. Here is a very unusual body-to-body fight; nobody understands Takanonami's man�uvre. It is then that the talented ozeki moves to the final phase of his plan and drags the Yokozuna in a fine backwards dance. 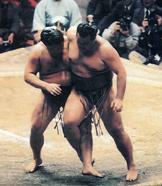 With the help of excellent footwork, all the while going backwards, the Ozeki wraps up Takanohana's left leg, thus depriving him of precious support, and topples him roughly backwards, with his right arm which relaxed its grip in order to get hold of the knot of Takanohana's mawashi at his back. Kawazugake! Great artistry in the space of 23.4 seconds, it is a pure wonder of a bout, which will remain for all time in the bouts of folklore. It is an unusual bout by Takanonami, as much in conception as in execution, and a well-earned first yusho. 1996 is definitely his best year and he continues his excellent performances. But Takanohana, who did not appreciate his great defeat, is on another planet and no longer allows anyone else the pleasure of winning any tournament at which he is present. For the last tournament at Kyushu, where the master is absent, Takanonami invites himself to a historic 5-way play-off with Wakanohana, Akebono, Kaio and Musashimaru, the last of whom finally wins the show. Of note in this tournament is another wonder in the fight between Takanonami and Akebono, where the ozeki, sure of himself, performs a tachi-ai in which he puts himself sideways on against the giant Hawaiian!! In much the same way as Takanohana, Akebono is dragged into a backwards walk, but this time he is toppled backwards by a neck throw. Kubinage! 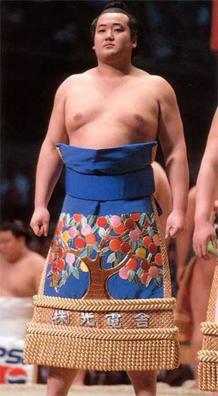 With his unusual style and his pleasant personality, Takanonami becomes one of the most popular rikishi. The competition is tough and his best years are now behind him, but he still has several surprises when untroubled by injury. So, although he begins the year 1997 with a make-koshi, he ends it with a brilliant yusho where he again beats Takanohana, who finally seems human again, (3 yusho that year), in a classic body-to-body bout ended with an uwatenage. It is his last real feat of arms, because afterwards, the extraordinary flexibility of his ankles fails him, and with the reduction in power that comes with advancing age, he loses his Ozeki rank. However Takanonami was one of the rare Ozeki that having been demoted to Sekiwake succeeded in immediately winning 10 bouts to regain their rank. In the end, he admitted to fighting just for the public, and to give himself some memorable moments, as for example his only two kinboshi, won against his rival Musashimaru. Hats off to you sir, and thank you!